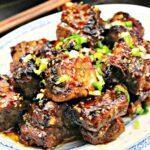 Sticky Sweet Chinese Ribs! 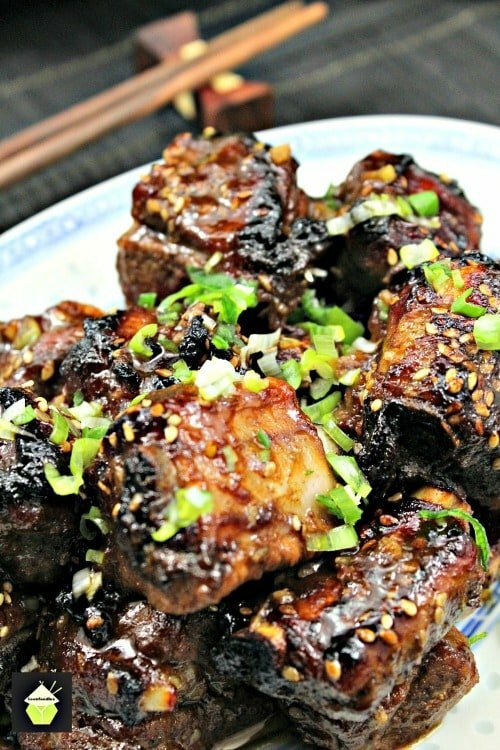 Delicious sticky Asian ribs. 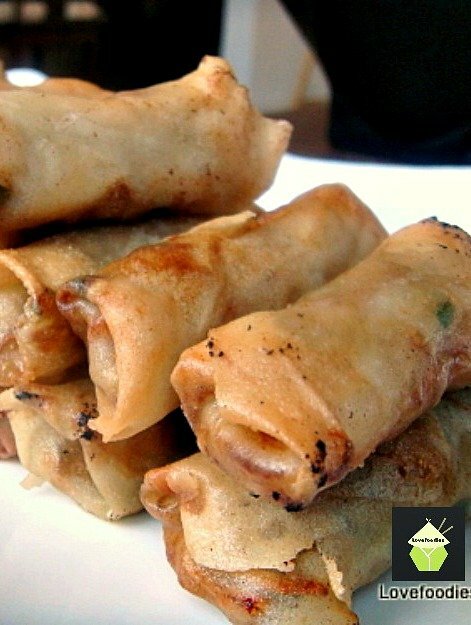 Great as an appetizer, party food or part of a Chinese Dinner. Very easy to make too! Sticky Sweet Chinese Ribs! Oh my goodness, I really love this recipe! The flavours are simply out of this world. 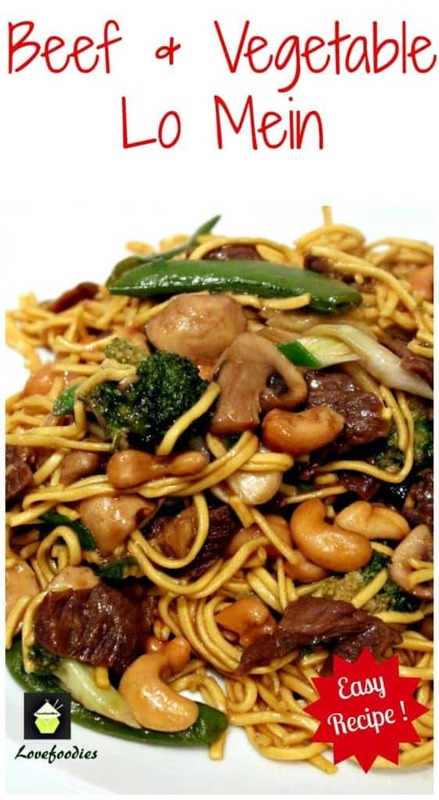 You get the sweetness from the sugars, in contrast with a little salty from the soy sauce, and a background peppery hint with a ‘bite’ of ginger. When all these flavours come together, you end up with a plate of sticky sticky… yes, they are sticky! spare ribs. 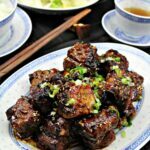 These sticky sweet Chinese ribs are incredibly easy to make and can be served as a starter, or a dish as part of a party, say a buffet, or as one of the dishes for a Chinese banquet. You can also prepare these a day ahead, and leave to marinade overnight, and pop in the oven just before you’re ready to serve. For this recipe, I’ve baked them in the oven. You can, of course, use your grill/bbq or air fryer. Whichever suits you! 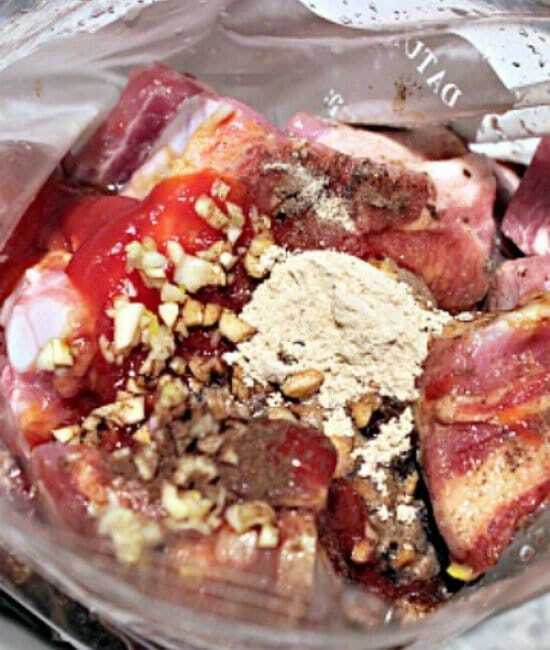 Another tip is if you want to make ahead, you can prepare everything and put the ribs in the marinade in a sealed freezer bag and get out to defrost when you need them. 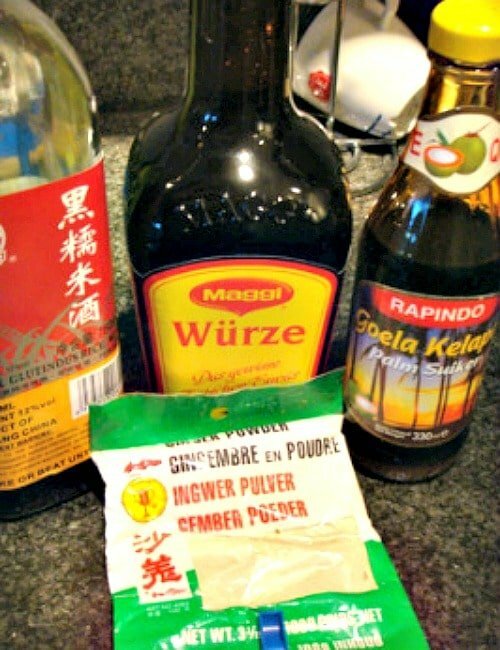 I have used a variety of ingredients for the marinade which are popular in many oriental dishes, for example, Palm Sugar, often used in Thai desserts, Chinese rice wine, Maggi, or soy sauce and so on. You can also choose to add some chilli peppers to this recipe if you want to spice it up. 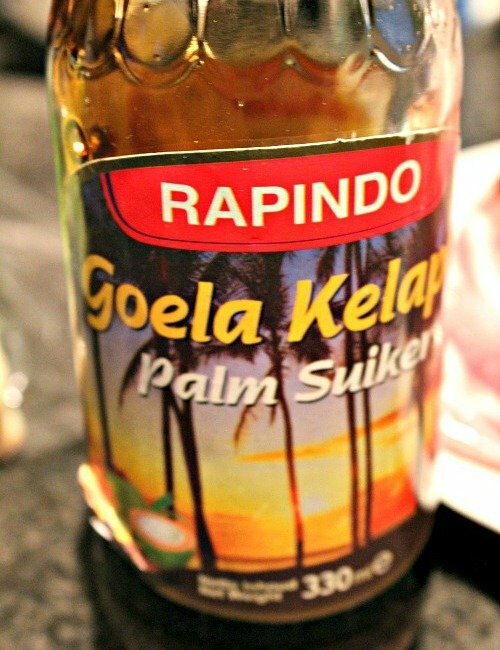 The combination of these ingredients makes for a very tasty, delicious marinade, and can be used not only for ribs but also for chicken wings, drumsticks etc. 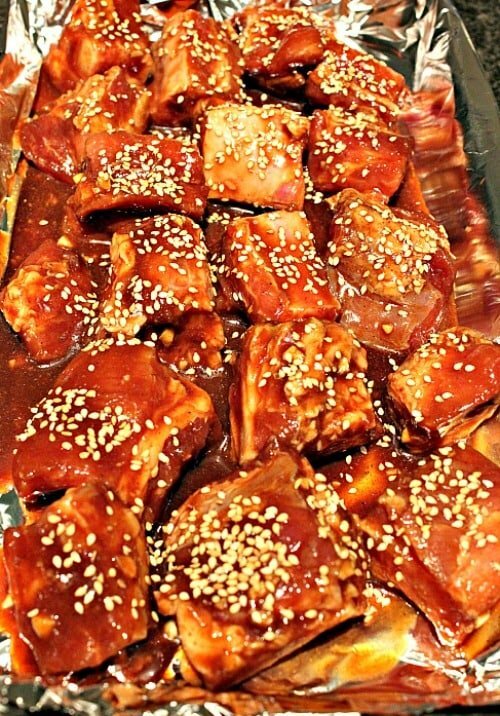 So let’s get straight to the recipe and see how we make our sticky sweet Chinese ribs. So delicious! Please enjoy! *if you can’t get hold of Chinese rice wine, dry sherry is a pretty close match. This is a really simple recipe! 1. Heat oven to 400F, 200C or gas 6. 2. 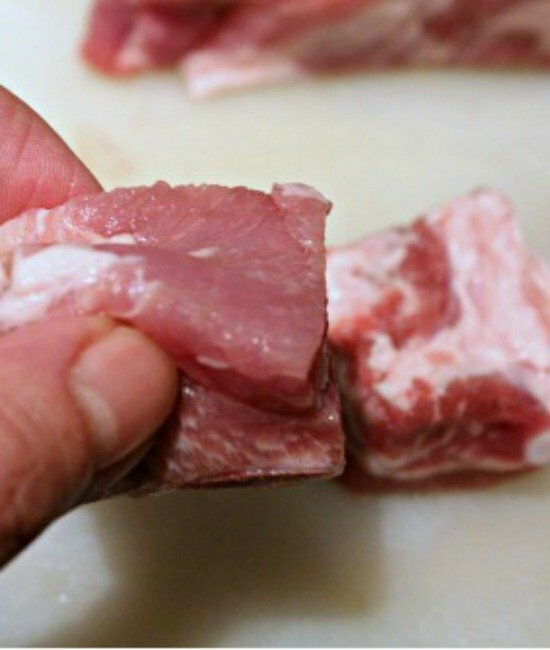 Rinse the 1-inch pieces of chopped ribs under cold water and pay attention to remove any loose bones where they have been cut. 3.Throw all the above ingredients except the sesame seeds and scallions/spring onions, into a bowl or ziplock bag with the ribs and leave to marinade for 30 minutes. The best way to make sure all the meat is coated is to get stuck in with your hand…mix the ribs well with all the marinade. 4. Put some foil on a baking tray (this will stop any of the palm sugar sticking directly onto your tray when it goes in the oven). 5. Lay the ribs on the tray spread out so they are not on top of each other. Then use a teaspoon and sprinkle the sesame seeds all over. Place in the oven. Depending on the size of your ribs, thick ones will take about 20 minutes, or until the tops go a crispy brown, like in the main photo. 6. The ribs will be ready when they look like the photo below. Put on a plate and sprinkle some chopped spring onion/scallion over and viola! Tasty succulent sticky sweet ribs! Top Tip – make more than required. Your guests will ask for more, that’s for sure. 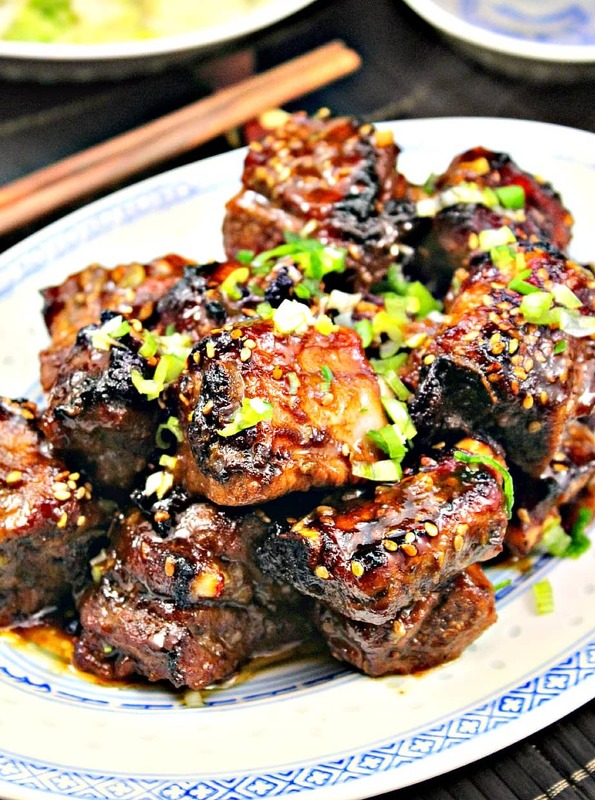 We’d love to hear from you and what you thought of our Sticky Sweet Chinese Ribs recipe. Did you make any changes or add some other goodies? Let us know in the comments below. Thanks for reading and happy cooking! Sticky Sweet Chinese Ribs! Oh my goodness, I really love this recipe! The flavours are simply out of this world. You get the sweetness from the sugars, in contrast with a little salty from the soy sauce, and a background peppery hint with a 'bite' of ginger. When all these flavours come together, you end up with a plate of sticky sticky... yes, they are sticky! spare ribs. 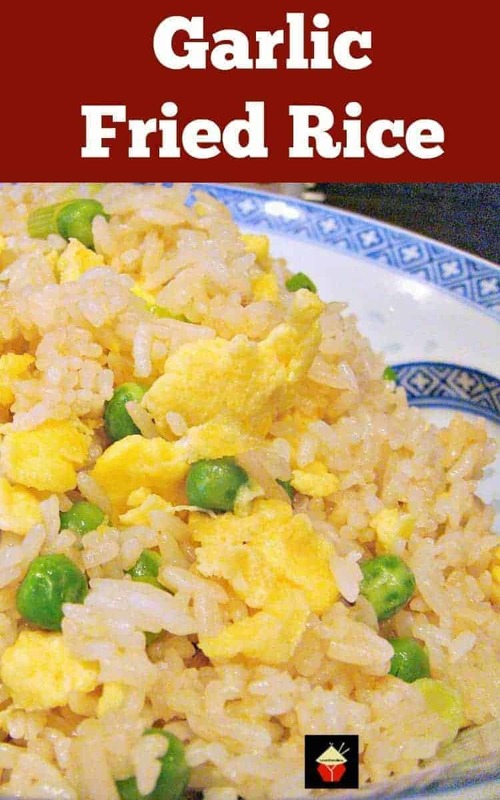 These are incredibly easy to make, and can be served as a starter, or a dish as part of a party, say a buffet, or as one of the dishes for a Chinese banquet. The amounts will be enough for 3- 4 thick and meaty pork spare ribs. save left over marinade for basting if you are grilling your meat. Heat oven to 400F, 200C or gas 6. Rinse the 1 inch pieces of chopped ribs under cold water and pay attention to remove any loose bones where they have been cut. Throw all the above ingredients except the sesame seeds and scallions / spring onions, into a bowl or zip lock bag with the ribs and leave to marinade for 30 minutes. The best way to make sure all the meat is coated is to get stuck in with your hand...mix the ribs well with all the marinade. Put some foil on a baking tray (this will stop any of the palm sugar sticking directly onto your tray when it goes in the oven). Lay the ribs on the tray spread out so they are not on top of each other. Then use a teaspoon and sprinkle the sesame seeds all over. Place in the oven. Depending on the size of your ribs, thick ones will take about 20 minutes, or until the tops go a crispy brown, like in the main photo. The ribs will be ready when they look like the photo below. 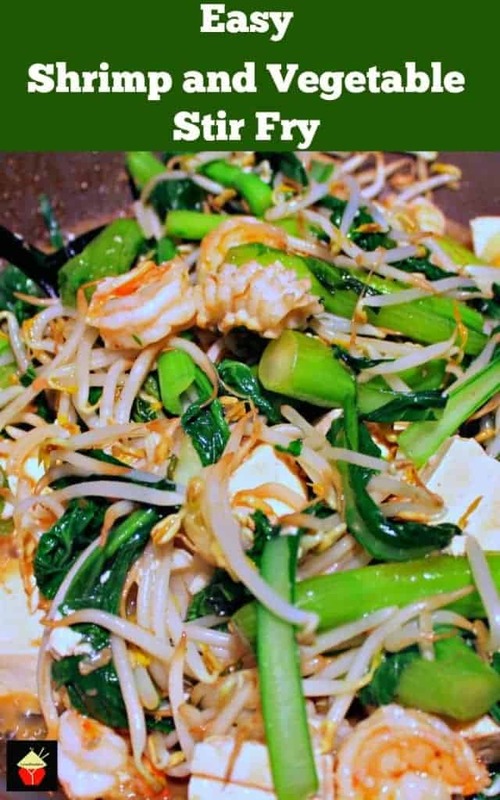 Put on a plate and sprinkle some chopped spring onion / scallion over and viola! Tasty succulent sticky sweet ribs! I,m really loving how these ribs look and the flavor profile. I take exception with the 20 minute roast. The tops may look all crispy, but I don’t think the meat will be tender. Someone asked about short ribs, and those will take a long time to be tender. I will try them with a longer baking time on a lower temp, then higher heat to crisp. Maybe on the grill. Thank you for sharing. Hi Vicky, thanks for your compliments! With regard to the cook time, as you know, it will often depend on how much meat are on the ribs and also how much fat is in them too, regarding how tender they will be. The cook time here is not going to give you a ‘fall off the bone’ effect. That would require a little more work, and if you do decide to cook them longer, please do keep an eye on the crispy tops because of the caramelization, they will catch much faster due to the sugars n the marinade! Hope that helps, and please enjoy! Can you use short ribs??? Hi Melissa, yes indeed! They would be fabulous and very tender too! Fantastic looking ribs here; love the Asian flair! Ohmygosh!!!! Gorgeous! Bring on the napkins! Love the sound of this recipe! 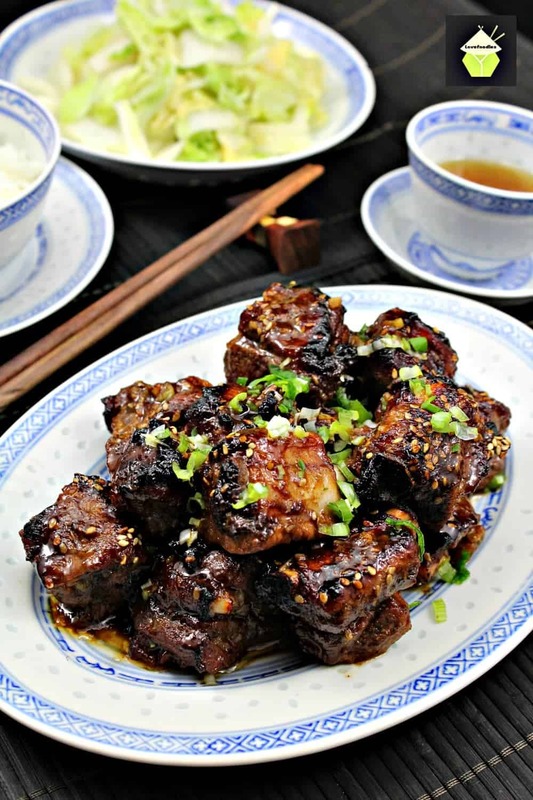 Your Sticky Sweet Chinese Ribs are sure to be a favourite at our house! Thank you April! You must try them soon. I got these ribs from the butcher at Tesco, they are meatier then the ones you get in the ready packs. Oh soooo delicious! I hope your family will enjoy them too!